Today is Memorial Day. For many, it's a nice day off from work, a time to barbecue with friends and family, to shop, or to hit the beach. For those serving our country, it's a reminder of the risks associated with serving our nation. For Memorial Day isn't about Veterans, it's a day to remember the Fallen Heroes, those who have died in service to America. We're republishing an article from today's Business Insider, as we think it's the best expression of what to do today, said better than we could. So Happy Memorial Day- think of those who have given the ultimate sacrifice. Do not thank me for my service because today is not about me at all. That's what a number of fellow military veterans said, when I asked what they wanted people to know about Memorial Day. "It's not about us," said Staff Sgt. Jay Arnold, a soldier with the Illinois Army National Guard. "It's about those who went before us." 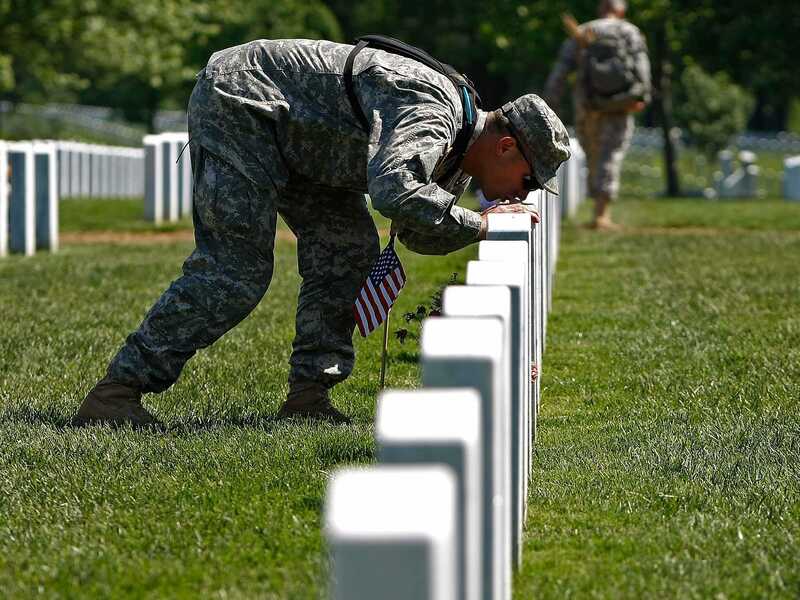 While often seen as just a day off work or great time to barbeque, Memorial Day — not to be confused with Veterans Day — is a day of remembrance for approximately 1 million men and women who have died in defense of the United States since 1775. "Memorial Day isn't about romanticizing war or worshiping military veterans. It's a day to recognize personal sacrifices of veterans and active military alike, regardless of their inclinations toward war," said Tech Sgt. Bill Monahan, an airman serving at Davis-Monthan Air Force Base. "Too often today, ones political beliefs skew opinions on what constitutes honorable service so it is important to have a day where we can look back at who laid it all on the line." The day has its roots in the Civil War, with a "Decoration Day" taking place three years after the war's end to decorate Union graves with flowers. Similar observances happened around the same time in the south. But it was Maj. Gen. John A. Logan who declared the day should be observed on May 30. With an act of Congress in 1971, the day was proclaimed a national holiday for the last Monday in May and expanded to honor all who have died in American wars. So you should definitely enjoy your day off, grill some steaks, and spend time with family and friends. But I challenge you — if you don't have any connection to the military — to really learn about just one fallen service member. They didn't join the military for fame or reward, ambition or status. "In simple obedience to duty as they understood it," reads the inscription at Arlington's Confederate Memorial. "These men suffered all, sacrificed all, dared all — and died." "It is important to remember them, and it is just as important to enjoy yourself this weekend. To spend time with your family and friends," he told BI. "What better assurance to them that they did not die in vain? Enjoying your freedom and understanding it's value is the best way to honor the sacrifices of my friends. That's the way they'd want you to spend Memorial Day. Remembering them, and being a good friend, father, and an American is the best way that I can honor their memory."